Check-in this year will be simpler than ever. As an athlete you should have received or will receive by email a unique QR code (a fancy type of bar code) that is unique to you. Be sure to print that code and bring it with you to the Dixie Center (1835 Convention Center Drive, St. George). You can also access that QR Code by logging into your account and printing your athlete summary. We’ll scan it and print your athlete ID badge. The code accelerates the whole check-in process. Remember that before you step on the field / diamond / court / deck / etc. for competition, you MUST first check-in. At check-in you will receive your athlete ID, which must be presented upon request at sport venues. The ID acts as your ticket to get into your sport social among other things. You also get your official athlete shirt (a very nice shade of green this year), welcome bag, $10 dinner ticket and much more. Be sure you give yourself enough time and don’t skip the check-in. PLEASE NOTE FOR SOFTBALL: All Softball players are required to wear a wristband in order to play. 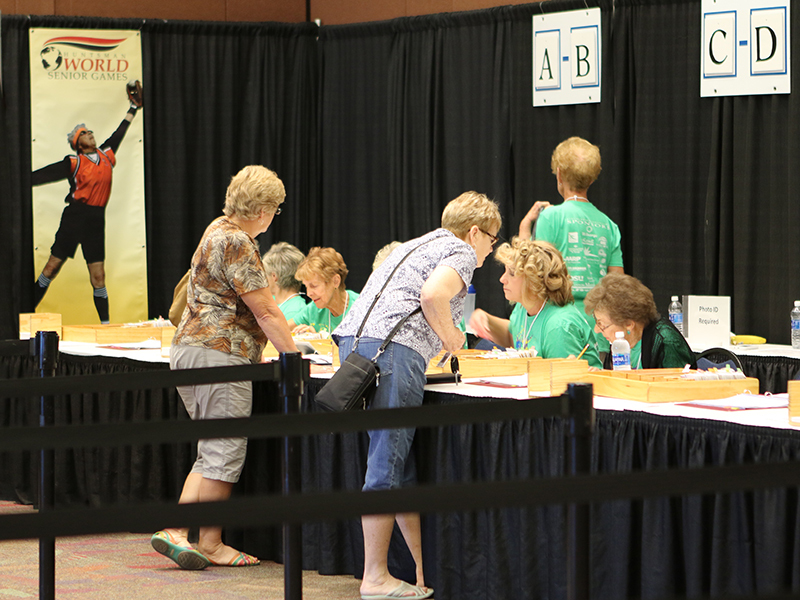 Softball players will receive their wristband at check-in at the Dixie Center. This year, the wristband is a slim 3/4” and a lovely color that is sure to be a wonderful accessory to your uniforms. Q: I didn't receive a QR code by email. Can I still check-in? A: If you didn’t receive a QR code in your email, check your spam trap to see if it landed there. If you still can’t find it, don’t panic. We’ve got a back-up plan in place to get you checked in. Just bring a photo ID and your athlete number to the Dixie Center and we’ll get you taken care of. The QR code makes the process faster, but we can still generate your Huntsman World Senior Games ID badge without it. Q: I don’t have a printer. Can I bring the QR code on my phone? A: You bet. Our scanners will work just as well scanning the QR code from your phone. But if not, see the answer above. Q: Can you send me my partner’s / team mate’s QR code(s) so I can check in for them? A: No. Every athlete must check-in for themselves. This way we can authenticate that those who are competing are legitimately registered and have completed all the necessary requirements. Plus, we like to see you and welcome you in person to the Games.